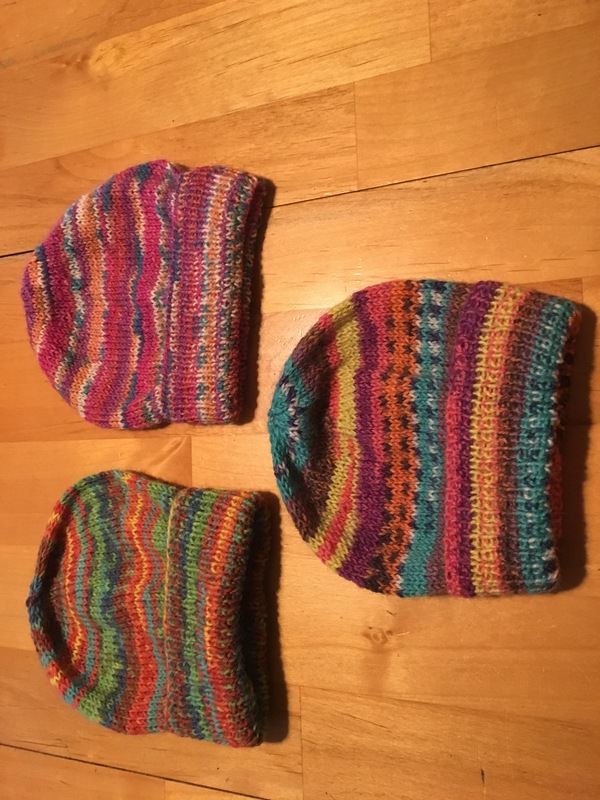 Knitters, crocheters and sew-ers (sorry about the hyphen, but – sewers??) out there will know just what this means. For the rest of you, some of us seem to acquire a backlog of lovely (and sometimes not so lovely) yarns and fabrics that in the real world we never get round to using. I plead guilty to this, but in mitigation I must say that some of ‘my’ stash has been passed on to me for a good purpose. And a good purpose is what I’m currently using it for. I’ve written before about wanting to help raise money for Bath City Farm by making up some goods for sale. 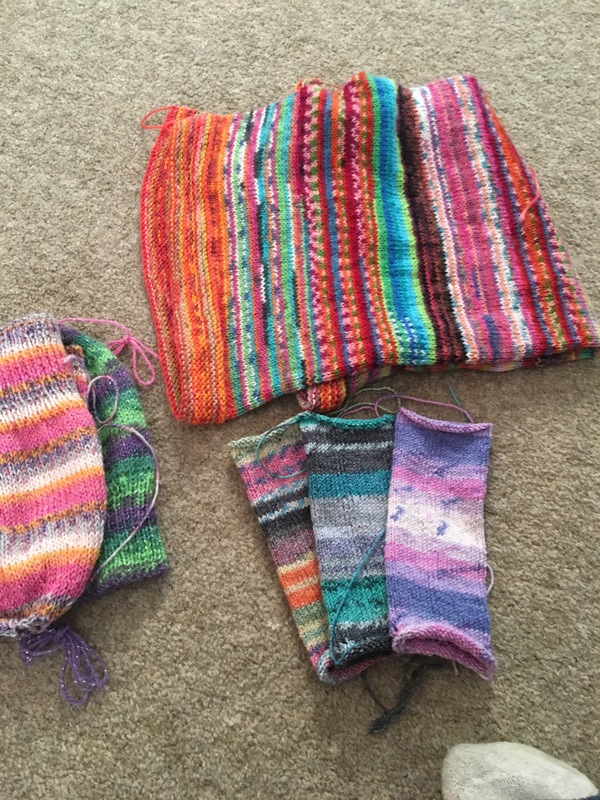 This autumn I’ve had a lovely time sorting out and working my way through a large mixed bag of yarn donated by a friend of one of the Farm workers. 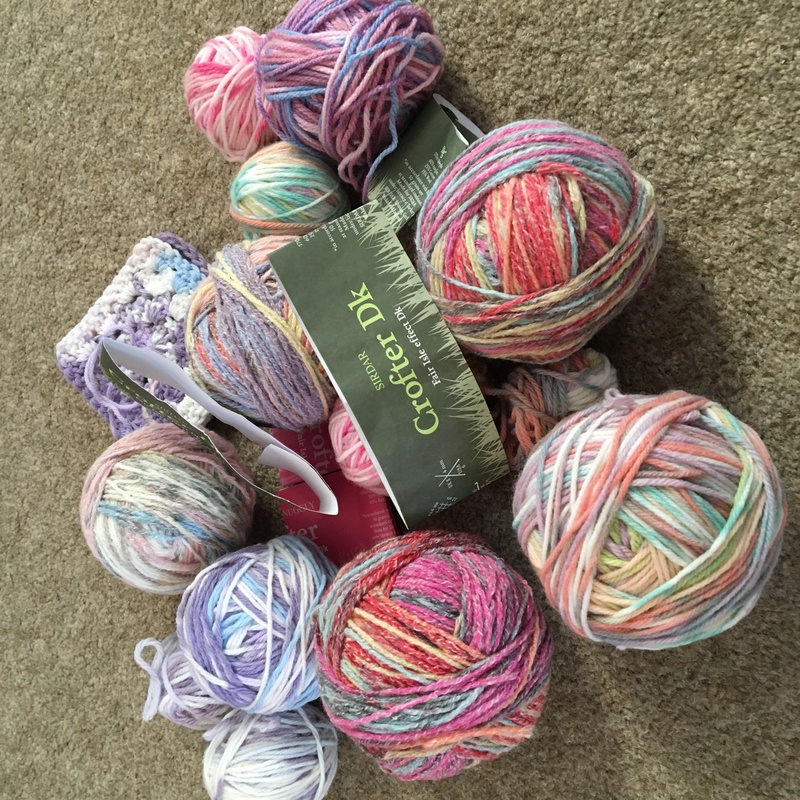 double knit – Crofter DK. This is an acrylic/cotton/wool mix. I’ve used it once before to make a crochet pram blanket. I will probably do something similar. 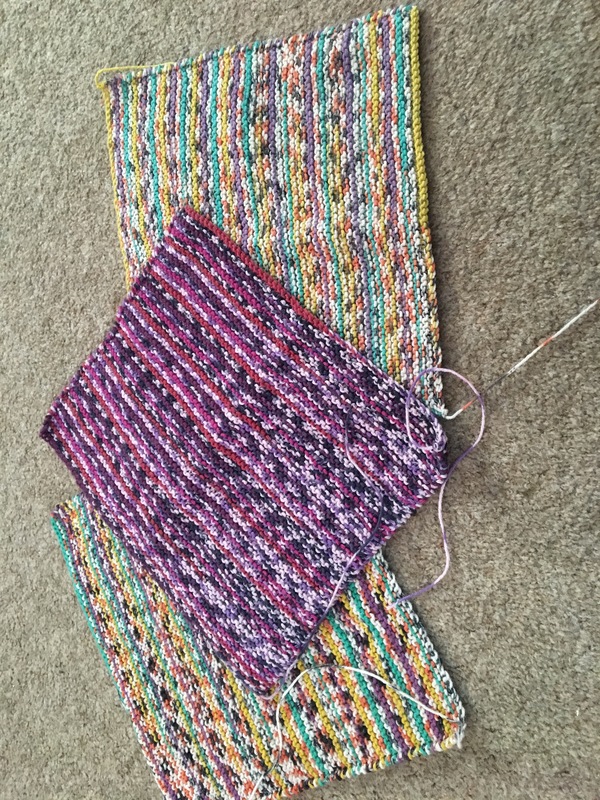 another 4 ply self-coloured yarn, I’ve no idea what this is but I’m guessing probably at least in part acrylic. It has a twist on it that to my mind makes it slightly too harsh for baby hats. Perfect for phone socks. 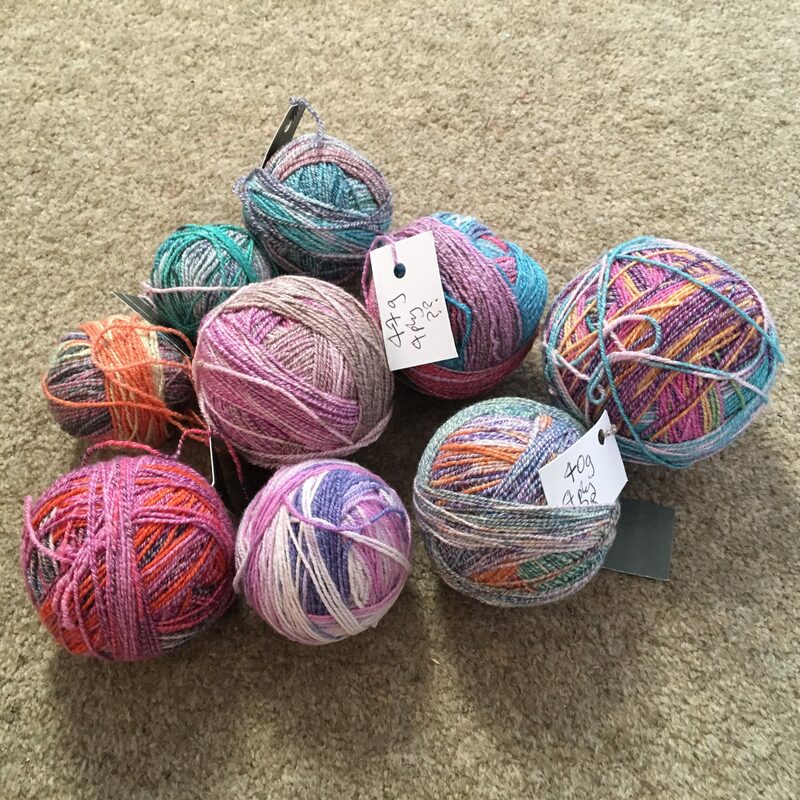 Next I balled up all the yarn and weighed each balls so I could decide how to make best use of it. I labelled each ball showing the weight. Then I began knitting. I knitted on trains and buses, on benches as we took a break on walks, in museums and galleries while I relaxed (people watching). I knitted at home and on holiday. I spent cosy cold wet evenings indoors knitting while listening to podcasts or watching TV. Over the past few years I’ve collected and created a few simple patterns for this. There is a baby hat (in a range of sizes), a pram blanket, a phone sock, and a dishcloth. I’ve noted how much yarn is needed for each, to avoid the annoying experience of getting almost to the end and running out of yarn. I haven’t nearly finished yet. I will carry on working my way through this stash, and I confidently predict that there will be quite a few more items ready in the spring. This Saturday is Bath City Farm’s Christmas Fair. All my colourful items will be on sale. I hope they may raise a useful bit of money. Do come along if you’re in the area – we’d love to see you there! There will be lots of things for children to do, crafts to buy and home made refreshments from our lovely cafe kiosk. 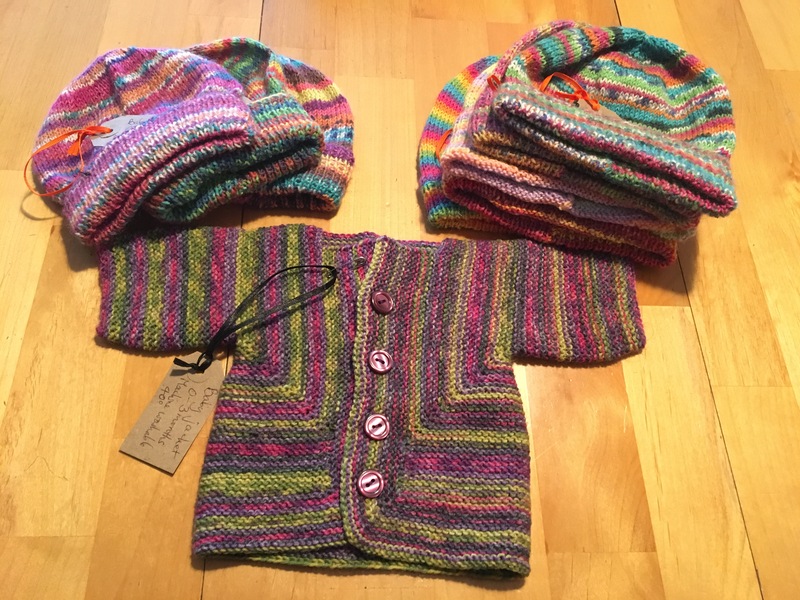 This entry was posted in Bath, Community, Craft, Do what you can with what you have, Uncategorized and tagged Bath City Farm, Community, knitting, Simplicity, upcycling. Bookmark the permalink. I love this post, Deborah. Well done on all that knitting for such a good cause!! May the sale be a huge success. I’ll be knitting in public this Saturday, and hope to get a decent amount done on a sock that’s been on the needles far too long. Like you, I love to be productive in those in-between moments 🙂 . On stashes: I find I get overwhelmed when I feel I have too many projects “lying-in-wait”, so I try REALLY hard not to buy yarn *just because*. I recently cleaned out my bin of yarn and decided to donate many part-skeins — leftovers from projects of years ago that I’m quite certain I’ll never make use of, but which I hope someone can. They’re doing no one any good by sitting in my bin, as your post really nicely illustrates. Stashes – yes, me too. I need to re-train myself to hold back when I visit a very beautiful yarn store. I’m on catch-up with the projects, and hope to finish all but one exceedingly long-standing and complicated project during 2019. I’m also currently on a ‘sort it out, get rid of what’s not used/needed/loved’ jag, and am doing well. Next on the list is the fabric stash, though that may wait till the new year I think. Have been massively inspired by an instagram account I came across recently, I’ll write about it soon because she is so positive and at the same time realistic. Plus the run-up to Christmas feels like a great time to donate to charity shops, when they’re most likely to sell things.